Welcome to the Oregon Mushrooms Wholesale page! Since 1999, Oregon Mushrooms has been selling truffles, mushrooms, and much more to gourmet food lovers across the country. We started on eBay, expanding to an online store to meet the demands of our customers who wanted a wide range of delectable mushrooms to choose from. Over the years, our range of products has expanded to include truffle oil, flavored honey, artisan salts, spices, spreads, and other specialty items. We take pride in offering mouth-watering mushrooms and gourmet delights that customers love. 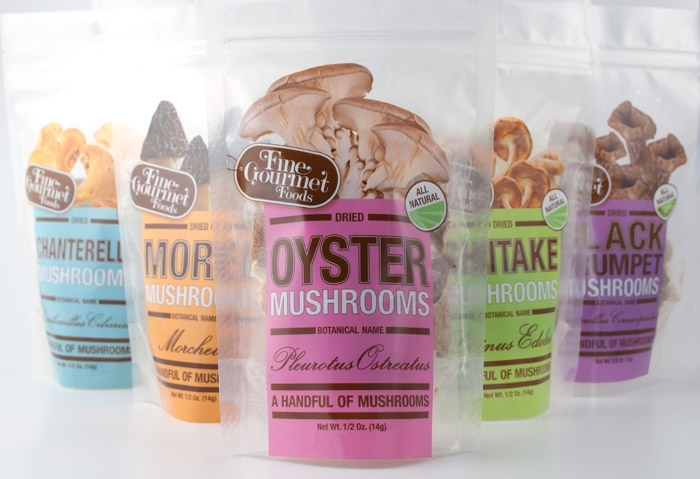 Not only does Oregon Mushrooms do a brisk business in retail with the best mushrooms Oregon has to offer, we also make wholesale quantities of our gourmet mushrooms available. From fresh to dried, whole to powder, and from morels and matsutakes to truffles and black trumpets, Oregon Mushrooms has ample quantities of these mushrooms for sale. Retail Packs are now available, see bottom of this page for images. We also carry a line of Artisan Sea Salt, Saffron, Truffle Balsamic Vinegar, Balsamic Creams, Truffle Oils, Truffle Paste, and much more. We sell to restaurants, produce companies and grocery stores across the United States. The restaurants we supply order weekly and are very happy with our products. We have competitive prices and excellent quality. Call or email us for prices and availability. Wholesale minimum order is 12# of fresh or frozen produce. 6# minimum for dried mushrooms. We now accept credit cards via Intuit Payment Network, it is easy to pay this way, we email you an invoice and you just enter your information. It is fast and secure. We no longer accept credit cards over the phone for wholesale orders for security reasons. Through Intuit you can pay from your checking, savings or credit card. We never see your information. We also carry unusual mushrooms during their seasons, such as lion's mane, honey mushrooms, chicken of the woods, cauliflower mushrooms, fried chicken, and sometimes other mushrooms. The different types of wild produce, such as fiddleheads, stinging nettles, watercress, miners lettuce, asparagus, fiddleheads, wild onions and ramps we also have on hand during their seasons. We also have frozen huckleberries, frozen elderberries, frozen chanterelles, frozen morels, frozen european and domestic porcini, Oregon white and black truffles, perigord and burgundy truffles all year. All of our fresh mushrooms are organic, the cultivated are certified, the Wild are not certified, but are wildcrafted. We have Frozen Products: Frozen Huckleberries, Frozen Oregon Black and White Truffles, Frozen Alba Truffles, Frozen European Porcini, Frozen Domestic Porcini, Frozen Ramp Bulbs, Frozen Mexican Truffles, Chanterelles, Morels, Elderberries and more. We wholesale everything on the website, plus we have some specialty items that we sell wholesale. Please email us at [email protected] or fax us at 1-541-850-2512 with the following required information, or call Scott Cossairt at 541-850-6194. Email is preferred since it gives us the ability to know what you are interested in to start with and then a follow up call after we email you your price list. Type of business such as produce, distributor, restaurant, catering, etc. We will contact you with our wholesale prices within 48 hours, usually within 24 hours. 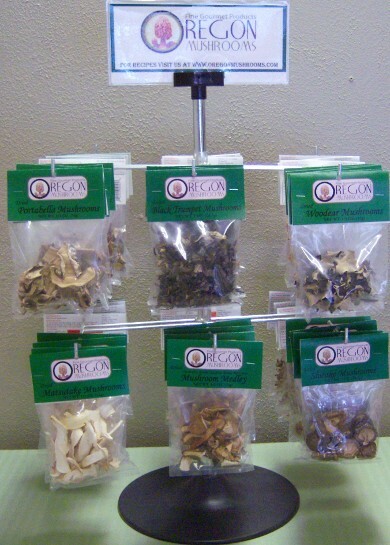 Now carrying our mushrooms in retail packs, 1/2 ounce bags that are pictured below, contact us for prices. We have 1 oz retail packs pictured above. After you have emailed us or called us, we will send pricing to you first. The retail packs are wonderful for stores, for wineries, specialty food establishments. They sell really excellent. Our top sellers are: morels, porcini, chanterelles and shiitake. The case size is 10. For your first order, you can mix it up to see what sells best for you.